For the second time in less than two years, I am shifting my public support from a political candidate to his opponent. I did it in 2012 when, after having endorsed Rob Bonta for California Assembly, I learned that Abel Guillen‘s political views more closely aligned with mine. I am doing so again now, by announcing my endorsement of Ro Khanna, who is running against Mike Honda for Congress in CD 17. My reasons for switching this time are very different. I have the utmost respect for Mike Honda. His record of supporting human rights and civil liberties, while advocating a progressive agenda, is exemplary. You can count on Honda to vote the right way almost every time. Indeed, I think it says a lot that before this election, his biggest source of campaign contributions were human rights activists. Honda, moreover, is an extremely pleasant legislator, well-liked by everyone who knows him. He has done very important work, in particular seeking justice for Japan’s comfort women and standing up for American Muslims. At first thought – and second and third and fourth – the idea of endorsing someone else seems crazy. And, indeed, it has taken me several months of careful thought to come to this decision. I’ve come to it because while I am deeply appreciative about everything that Mike Honda has done in Congress, I think that Ro Khanna can and will do even more. Khanna is a one-in-a-generation sort of politician, a statesman-in-the-making who combines intellectual brilliance with a thorough understanding of our economic and political realities and a clear vision of what this country needs to advance. He is pragmatic about what can be accomplished in our current political environment, has concrete plans on how to reach out to legislators from all political persuasions, but he’s clear as to what is not up for compromise (things like human rights or a woman’s right to choose). More importantly, Khanna is both convincing and inspiring. Khanna profoundly believes that the job of government is to promote the general welfare and it is a job it can get back to doing well. He believes in the political philosophy of the founding fathers, and in their dream of America as the political heir to Athens. When you hear him speak, his unique mix of optimism and pragmatism quickly becomes contagious. I fell under his spell when I interviewed him last year and you can notice similar reactions in journalists and bloggers who’ve interviewed him at length. It’s this effect which provides him with an ideologically-diverse base of financial and other support. Watch, for example, how emotional football legend Ronnie Lott becomes when speaking to Khanna about his expectations for his candidacy. 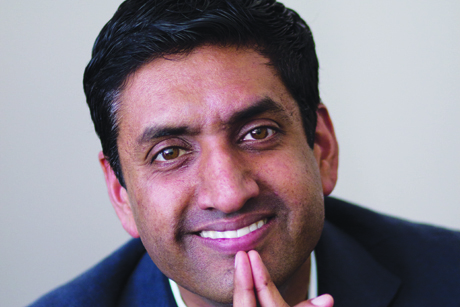 It’s been difficult to ignore, however, the parallels between Ro Khanna and Barack Obama. Obama also spun beautiful webs when running for office – he spoke about hope and restoring the rule of law, only to go back on pretty much all of his promises as soon as he was in office. Khanna started his political career walking precincts for Obama, and his current campaign is being run by Obama former operatives. For months, I’ve feared that Khanna was also a con. But fears are ultimately prejudices, and neither I nor the country can afford to dwell in them. In reality, Khanna has been consistent on the political philosophy he’s expressed throughout the years. He first ran for Congress in 2004, as a statement of opposition to the war on Iraq and the Patriot Act. He has made it clear in interview after interview that he believes civil liberties are the cornerstone of democracy and that we must support them at home and abroad. People whom I respect and have known Khanna for far longer than I, believe he is the real deal and offer their support. Chief among them is Lawrence Lessig, a law professor and director of the Edmond J. Safra Center for Ethics at Harvard University. Lessig is one of the foremost advocates of political reform in America, and has written and spoken widely on the corrupting influence of money in politics. I respect his opinion greatly. I also respect the opinions of teachers like Cheryl Cook-Kallio. Ro Khanna started volunteering in her classroom almost a decade ago because, he told her, his life had been changed by a teacher. She was proud to tell me how Khanna wrote a recommendation to the University of Chicago, his alma matter, for one of the students he mentored. That student just graduated law school and passed the bar. Finding a person with the intellectual acumen, knowledge base and political, social and ethical values that Ro Khanna spouts is rare. Finding such a person who actually wants to get involved in politics and has the commitment and desire to make a difference, is rarer still. Finding someone with all those qualities that can also inspire others is almost impossible. As much as I like Mike Honda and appreciate the work he’s done, I want to see Ro Khanna have the chance to prove himself in Congress. For that reason, I endorse him. I am not thrilled, however, about some of the positions that Khanna has taken – for example, concerning Congressional pay – and I have been disappointed at some of the childish antics that both campaigns have displayed. My public endorsement of Khanna will not prevent me from criticizing his policies and postures in the future. It should also put any criticisms I make of Honda into context. Full Disclosure: Khanna was one of the several politicians and labor groups who contributed to the slate of candidates with which I ran for Alameda County Democratic Central Committee in 2012. It’s official: Pete Stark is running for re-election. March 16 Update: Ellen Corbett decided not to run for Congress this time around, but both she and Khanna are pushing full speed ahead for their 2014 Congressional ran. Stark has two years notice, he better retire by then. I hope that Stark will take advantage of these last two years to go back to his principled and courageous heydays. Fight the good fights, stand up strongly and loudly for civil liberties and civil rights, and leave his children a name they can be proud of. Congressman Pete Stark has completed his filings and is now an official candidate for re-election for the United States House of Representatives. He’s running for District 15th, which includes the southern and eastern parts of Alameda county. Stark has four opponents so far, but none of them stand much of a chance. Eric Swallwell, a prosecutor and Dublin City Council member, is probably the most likely to provide Stark with a challenge. He is also a democrat and has support in his area (which I believe Stark has not represented before). However, he’s relatively unknown and I can’t see him raising enough money (unless he has rich friends). I know nothing about Mark Gonzalez beyond the fact that he is Republican. Chris Pareja ran as the tea party candidate in 2010, but is now positioning himself as an independent. As for the final candidate, Michael David Harris, I have no idea who he is – though he might be a realtor from Livermore, most likely Republican. 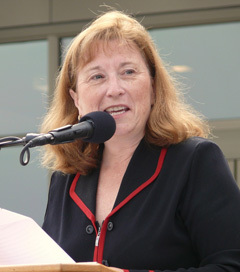 The real question, however, is whether State Senator Ellen Corbett, also a Democrat, will enter the race. Corbett, a native San Leandran and former Mayor, has long wanted to run for Congress. Her gamble is whether to do so now, against a well known Democratic incumbent who has been there forever (but who is 80 years old and in bad health), or to wait until 2014, when Stark may retire. While the latter scenario would usually make sense, her declared opponent would be Ro Khanna, a young former Deputy Assistant Secretary at Commerce for the Obama administration. While Khanna has no political experience, he does have a lot of money. He was able to raise raise $1.2M in the last quarter of 2011, mostly from Silicon Valley and the Indian-American community; he got $450K alone at one fundraiser at the home of a venture capitalist. Corbett, on the other hand, is not a particularly great fundraiser. And without money, it’s impossible for any candidate to get their message to the voters. We will know by Friday if Corbett throws her hat into the ring. My bet is that if she runs, she won’t file until the last possible moment, so as to not give Khanna the opportunity to run as well. Khanna has promised that he wouldn’t run against Stark, but observers believe he’d throw his hat into the race if Corbett wins. I can just envision his spies hanging around the office of the Registrar of voters on Friday, seeing if Ellen or one of her people comes by. It’s difficult to know how good a chance Corbett has. Stark has a lot of supporters and detractors, both among party operatives and voters – but he’s a sitting duck and as thus probably not worth investing on. My bet is that most people will stay out of the race until they see the June election results. Because of redistricting, Pete Stark will no longer be representing San Leandro (we get Barbara Lee now!) – but this is still an election worth watching. The California Citizens Redistricting Commission seems to have listened to us, and is keeping San Leandro whole in the new district maps. However, they’re cutting our long association with Hayward and we will now be bunched with Oakland/Alameda for both the California Assembly and Senate districts. This means that from a practical point of view it’s unlikely that any San Leandran politician will be able to be elected to the California Legislature – Oakland politicians are not only better known, but they are able to tap into deeper pockets for campaign contributions. But candidates for state office will still have to pay attention to San Leandro and our particular issues if they want our votes. It’s not the ideal situation, we’d have more political clout if we were part of a district that included Hayward, but it’s better than the alternative of being cut in two, as the earlier maps suggested. Sandre Swanson, who represents the 16th Assembly district that currently includes Oakland, will be termed out and several city council members from Oakland and Alameda are expected to run for his seat in 2012. I’m sure we’ll be seeing them around these parts soon. As for the Senate, we’ll be in a district that will now include both our current Senator, San Leandro native Ellen Corbett, and Loni Hancock of Berkeley. At this point it’s impossible to know who will be our state senator come 2012. Depending on what number the Redistricting Commission assigns to that senate district, there may be an election for that senate seat in 2012 or a senator may be appointed to the seat until 2014. San Leandro will not be lumped with Oakland in the new Congressional district (sorry Barbara Lee fans), but rather we will be part of a new district that goes as far south as northern Fremont/Newark and that includes of all Livermore and areas further to the east. This is an area currently represented in congress by both Pete Stark and Jerry McNerney. Stark is one of the most liberal members of Congress, while McNerney is a somewhat conservative Democrat. This new district will be heavily Democrat, but with a strong conservative base. It’s difficult to know what will happen if this district map is finalized. Stark could chose to run against McNerney in a primary, or against Zoe Lofgren, who will take over the southern part of Fremont/Newark that Stark currently represents. More likely, he’ll chose to retire. He’s 80 years old and in ill health, and still has a young family he could spend his last years with. Ellen Corbett has expressed interest in running for Congress before, and she may be willing to confront McNerney in a primary election. Indeed, this may be her only if not best chance to continue in politics. Of course, the maps issued today are the first draft. The Redistricting Commission will continue hearing testimony and may redraw the maps based on that. For that reason, I think it’s still important to continue writing to the Commission and asking them to make sure that San Leandro is kept together in the final maps.